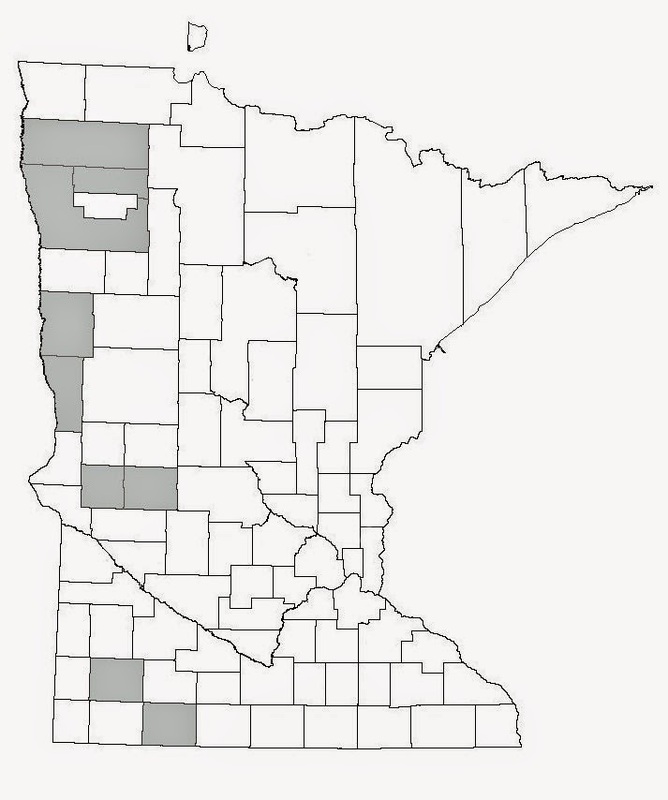 hyperbole, stating that Minnesota rural areas are “leading” the economic recovery, as 9 of 65 counties that have resurged to prerecession levels can be found there. Good on Minnesota then, that’s great news! So what about everyone else? With such lop-sided numbers revealing a middle America that is strong in jobs, and varying degrees of economic lag everywhere else, can we really point to a unified rural economy at all? Absolutely we can, and to me it makes even more sense than lumping “American Cities” together (which puts San Francisco, CA and Flint, MI at the same cocktail party). However, to do this, I prefer not to think of rural America’s past, or even its present. Call me an optimist (I am), but rural America has always been a vast region of unrealized economic and creative potential. For community development professionals, the quest has always been about finding the right key to unlock it. To me, one of the primary keys to unlocking this potential has been entrepreneurship, or more broadly, entrepreneurialism, as even big institutions, governments, and the local bridge club are capable of behaving in entrepreneurial ways. Entrepreneurs, by and large, live in the future. A common distinction in the academic literature is one that separates entrepreneurs from small business managers. Entrepreneurs tend to be “builders,” even of their own lifestyle, while small business managers tend to maintain what is already there. Both are important, but only one is, by definition, tied to job growth. Drawing from the Kauffman Foundation’s Business Dynamics Survey (2009), it was found that all net job growth in the United States from 1980-2005 was accounted for by firms less than five years old. I believe this signals that small business dynamics might be worth a look. Creating a causal link between entrepreneurship and job growth based on location has been tricky for entrepreneurship scholars, primarily because it is much easier to measure self-employment (which includes a lot of sole proprietors who are only creating jobs for themselves), and much more difficult to isolate firms that are growing. This is especially true in rural areas, where a low density of firms prevents the Census County Business Patterns (CBP) from revealing too much information that might identify the growth patterns of individual firms. However, we can make some important inferences. Back in 2002, it almost seems that Jason Henderson could have predicted some of the job growth patterns we see today. Henderson (2002) linked job growth to entrepreneurship, and noted that nonfarm proprietorship is higher in industries like agriculture, extraction, construction, and retail – all industries that have higher self-employment shares in rural areas than urban areas. Additionally, agriculture and extraction, and consequently construction, are robust sectors in the areas currently experiencing rural job growth. Shrestha, Goetz, and Rupasingha (2007) take the argument one step further, demonstrating that lagged proprietorship (since creating jobs takes a few years) was strongly related to job growth in rural areas when controlling for other socioeconomic factors, and this relationship was even stronger during periods of recovery from a recession, much like today. Similarly, Fleming and Goetz (2011) found that the presence of small (10-99 employees), locally-owned firms had a strong, positive effect on economic growth over the period from 2000-2007. If we go back about a decade to a period when self-employment may have predicted small business success today and examine the share of nonfarm self-employed persons to the total population, where are the highest self-employment shares? Perhaps not surprisingly, a map by Goetz (2004) demonstrates that they are in roughly the same areas with high job growth today. (See http://www.ruralsociology.org/wp-content/uploads/2012/03/Rural-Realities-2-3.pdf). 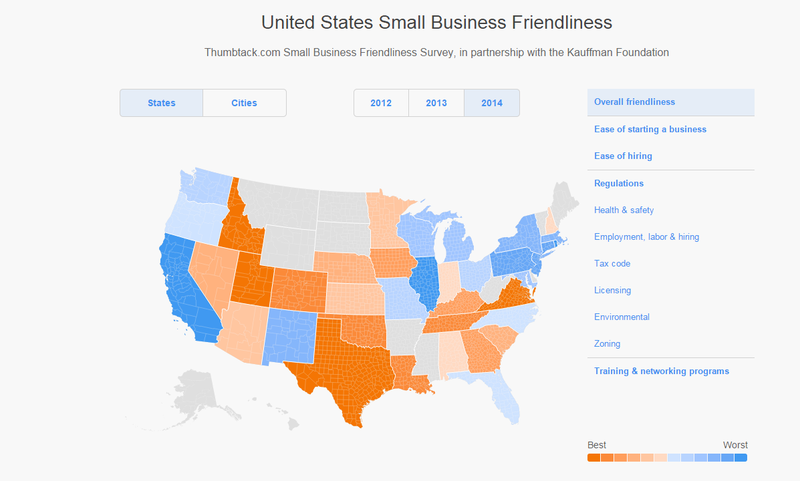 Another interesting coincidence has to do with the following map from the Kauffman Foundation’s 2012-2014 small business friendliness surveys. (http://www.thumbtack.com/survey#/2014/1/states). The survey measured key elements of small business friendliness, including everything from low taxes, easy incorporation, regulations accounting for the capabilities of small companies, ease of hiring, and more. With only a few exceptions, the states rated “most small business friendly” are roughly coterminous with those currently experiencing job growth. This may partially explain why there has been rapid job growth across the rural Midwest that stops suddenly in rural Illinois, one of the least small-business friendly states in the nation, and why job growth is sluggish on the West Coast, known for high quality of life and abundant scenic amenities (see McGranahan et al., 2010 for the link between entrepreneurial support, creative class migration, and natural space). It may also suggest why less populated states appear to be experiencing job growth with little explanation beyond a strong ag sector – even when agriculture is present in nearly every state. This post is not “smoking gun” proof by any stretch – a great deal more analysis is required to sort out the actual effects of small business development on the broader economy. Entrepreneurship is almost certainly not singularly responsible for these patterns, either. Education and population evolution certainly play large parts, as suggested in Marema (2014). However, these data give a nod toward entrepreneurs who, as a major contributor to economic growth, are often overlooked in favor of explanations dealing with the robustness of a particular sector. Or, perhaps it is assumed that such robustness will automatically stimulate entrepreneurship. As a community development professional, what matters to me is that entrepreneurship is something that can be developed, stimulated, and encouraged anywhere. While there are certainly many concurrent factors at play in the rural Midwest, entrepreneurship may very well represent one of the factors over which communities have the greatest direct control. Any community can find new ways to support entrepreneurship, starting with existing small businesses that are established, and more likely to create jobs. Then, the focus can shift to reaching out to people who are interested in starting a business, but feel that the risks are too great. Connect these people with established mentors. In fact, connect as many people as you can. That is probably the greatest achievement of any community development initiative, and the process of supporting entrepreneurship in rural areas is worthy of its own post (see Fortunato, 2014 for a deeper exploration by the author). Is entrepreneurship the missing link? It may be one of them, and supporting small, locally-owned businesses is an excellent strategy anyway for diversifying the local economy, enhancing the local multiplier, meeting critical needs and uncovering opportunities creatively. It can give your community an identity that cannot be duplicated, rooted in local tastes, culture, and talent. Can some of the Midwest’s job-creating magic be distributed more widely across rural America? Who knows, with a strong focus on those actors who have their eyes on the community’s future, your county might just become one of those “leaders” surging past prerecession levels in a few short years. In particular, one reason I see for viewing the rural economy as a common economy has less to do with its present unevenness, and more to do with its future opportunities. Some of the greatest challenges facing our global society are issues of food, fiber, water, and energy – all of which have solutions that reside primarily in rural areas. Paired with improving technology, national political support for entrepreneurship, and globalizing demand, rural areas offer extraordinary quality of life for entrepreneurs paired with very low overhead costs for starting a business (read: less risk). I, for one, look forward to seeing how the relationship between entrepreneurship and job growth plays out in the coming years, not just for the economic benefits, but for the meaningful leaps in creativity and well-being that can be achieved in inclusive, enthusiastic, entrepreneurial places. Henderson, J. (2002). Building the rural economy with high-growth entrepreneurs. Economic Review-Federal Reserve Bank of Kansas City, 87(3), 45-75. Fleming, D. A., & Goetz, S. J. (2011). Does local firm ownership matter?. Economic Development Quarterly, 25(3), 277-281. Fortunato, M. W. P. (2014). Supporting rural entrepreneurship: a review of conceptual developments from research to practice. Community Development, 45(4), 387-408. Goetz, S.J. (2008). Self employment in rural America: The new economic reality. Rural Realities, 2(3), 1-12. Kauffman Foundation. (2015). Small business friendliness survey. Kansas City, MO: The Kauffman Foundation, accessed at http://www.thumbtack.com/survey#/2014/1/states. Kauffman Foundation. (2012). Kauffman fast facts: Entrepreneurs and the economy. Kansas City, MO: The Kauffman Foundation. Kimball, J. (2015). Rural counties in Minnesota leading economic recovery. Star Tribune, January 24, 2015, accessed at http://www.startribune.com/local/289682881.html. Mandell, T. (2015). Rural counties have yet to recover jobs losses from recession; Metro counties have added jobs. The Rural Blog, January 21, 2015, accessed at http://irjci.blogspot.com/2015/01/rural-counties-have-yet-to-recover-jobs.html. Marema, T. (2014). Why plains states did better with jobs. The Daily Yonder, October 20, 2014, accessed at http://www.dailyyonder.com/why-plains-states-did-better-jobs/2014/10/20/7577. McGranahan, D. A., Wojan, T. R., & Lambert, D. M. (2010). The rural growth trifecta: outdoor amenities, creative class and entrepreneurial context. Journal of Economic Geography, lbq007. Shrestha, S. S., Goetz, S. J., & Rupasingha, A. (2007). Proprietorship formations and US job growth. The Review of Regional Studies, 37(2), 146-168.